Travel from the northern tundra all the way down to the Yucatan Peninsula while exploring North America. See the physical features that characterize the continent on a map. 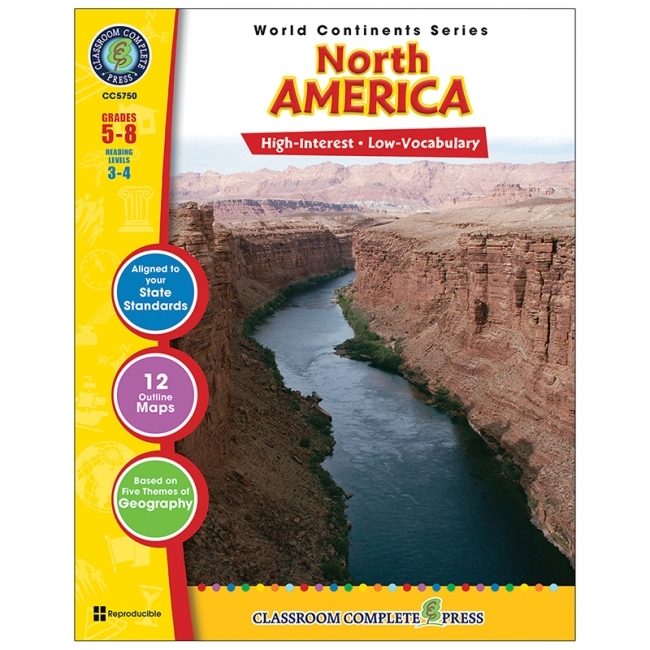 Find countries in North America and list them in order of most northerly to most southerly. Locate where many of North America's largest cities were developed and why they were set up there. Decide whether a situation is either a positive or a negative human/environment interaction based on the scenario. Compare the different kinds of transportation used on a fishbone graphic organizer. Collect facts about the Rocky Mountains, like physical characteristics and vegetation on a web organizer. Review a detailed region map of the United States to see transportation routes from one end to the other. Aligned to your State Standards and the Five Themes of Geography, additional maps, crossword, word search, comprehension quiz and answer key are also included. Includes 60 pages. For grades 5-8. Become aware of the endangered environment and wildlife that inhabit South America. Get familiar with the Caribbean Region, one of the world's most sought-after tourist destinations. Describe the relative location of Chile using the features around it. Discover how the Andes Mountains and the Pampas are different. Do some research in the Amazon River, the most famous river in the world. Use the Wildlife Organizer to find the different kinds of wildlife that are unique to the Andes Mountains, the Amazon Rainforest and the Pampas regions. Find information about the subway system in some of South America's largest cities, like Caracas, Venezuela and Rio de Janeiro, Brazil. Compare an ancient South American civilization with the one that exists there now on the Regions Change Over Time graphic organizer. Locate the countries and capital cities on a political map. 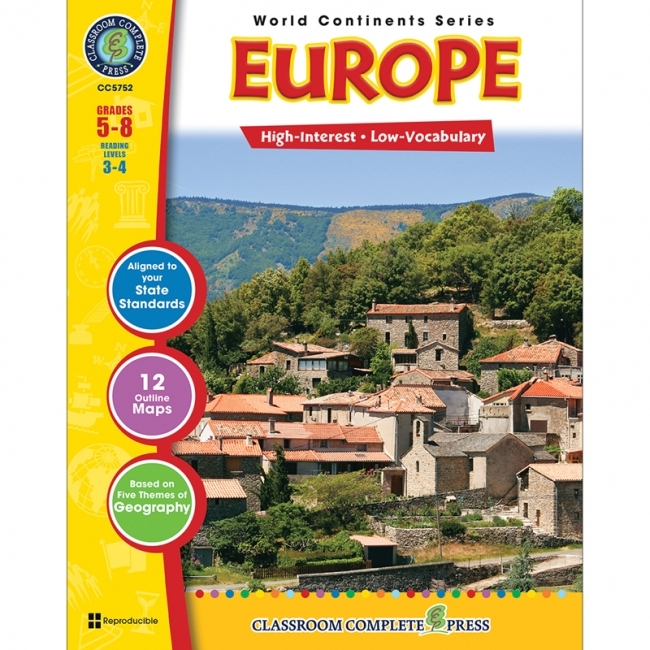 Aligned to your State Standards and the Five Themes of Geography, additional maps, crossword, word search, comprehension quiz and answer key are also included. Journey to the ancient centers of culture and trade with a trip to Europe. Understand the variety of ecosystems that inhabit the continent with a climate map. 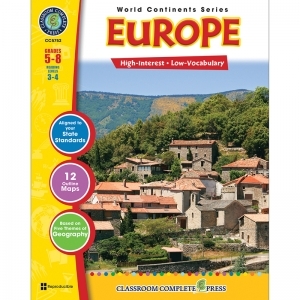 Gain a sense of direction by identifying the European cities that are found in the western and eastern hemispheres. Do some research into the famed Thames river and find out how long it is, which countries it passes through, and into which large body of water it flows into. Learn about the accident at Chernobyl and what negative effect it had on the environment. Find out why trains are an important form of transportation in Europe. Compare the physical characteristics of Provence and the Scottish highlands using a Venn diagram. Find the location of the Prime Meridian on an outline map and name the countries in Europe that it passes through. 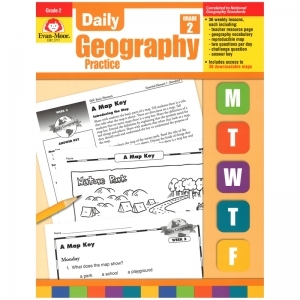 Aligned to your State Standards and the Five Themes of Geography, additional maps, crossword, word search, comprehension quiz and answer key are also included. Take a trip back to the cradle of life and explore the great Sahara Desert in Africa. Become familiar with the national capitals and major cities where the majority of the human population reside. Get a sense of the location of different countries in Africa by placing them in their correct categories in a graphic organizer. Collect facts about the Masal people of eastern Africa. Research two of the endangered animals in Africa to evaluate just how close they are to extinction. Design a pamphlet to showcase why the camel is suited to travel in the desert. Describe the Nile Valley and Serengeti Plains, and explain what makes these regions unique. Understand where the major lakes and rivers are in Africa by examining a waterway map. 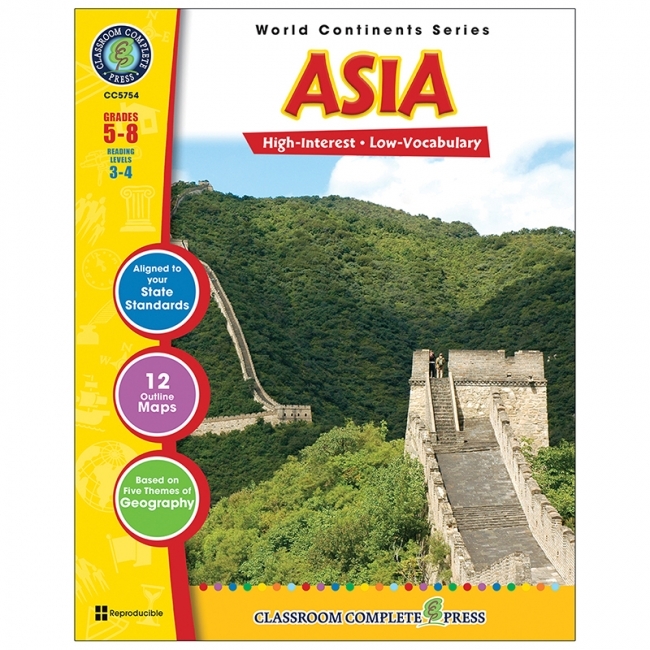 Aligned to your State Standards and the Five Themes of Geography, additional maps, crossword, word search, comprehension quiz and answer key are also included. Explore the vast landscape that is Asia, the world's largest continent. Find and label the Gobi Desert, Himalayas mountain range and Mekong Delta on a map of Asia. Find out how the city of Mumbai's location affected how it developed as a city. Record information about your chosen country in a flow chart graphic organizer. Learn how China's landscape is being changed by the Three Gorges Dam on the Yangtze River. Interview your parents to find out where your family originated, how and when they moved about, and how they eventually came to live in your present home. Compare an ancient Asian civilization with the one that exists there now on the Regions Change Over Time organizer. Look at the Asian continent on a world map to compare its location to the rest of the world. 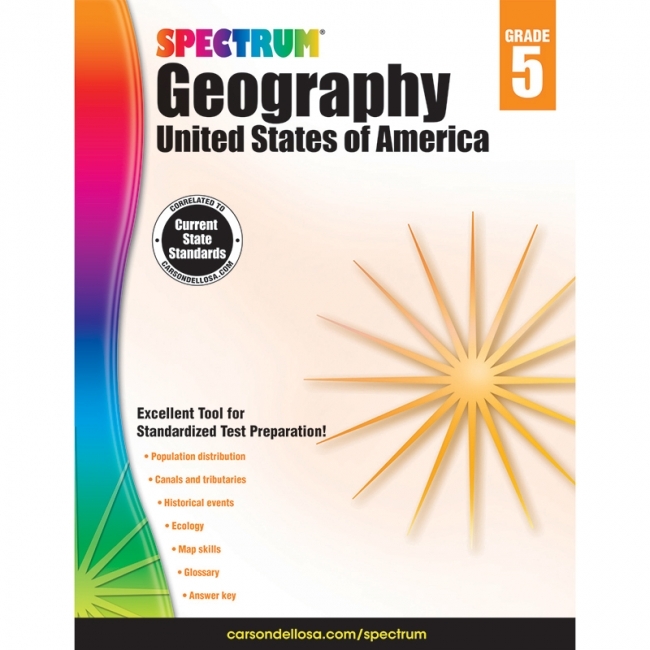 Aligned to your State Standards and the Five Themes of Geography, additional maps, crossword, word search, comprehension quiz and answer key are also included. Includes 60 pages. For grades 5-8. Take a road trip with our Americas 2-book BUNDLE. Start off by traveling the northern tundra all the way down to the Yucatan Peninsula in North America. Locate where many of the continent's largest cities were developed. Decide whether a situation is either a positive or a negative human/environment interaction based on the scenario. Collect facts about the Rocky Mountains on a web organizer. Then, become aware of the endangered environment and wildlife that inhabit South America. Describe the relative location of Chile using the features around it. Discover how the Andes Mountains and the Pampas are different. Compare an ancient civilization with the one that exists there now on a graphic organizer. Each concept is paired with blackline and color maps. 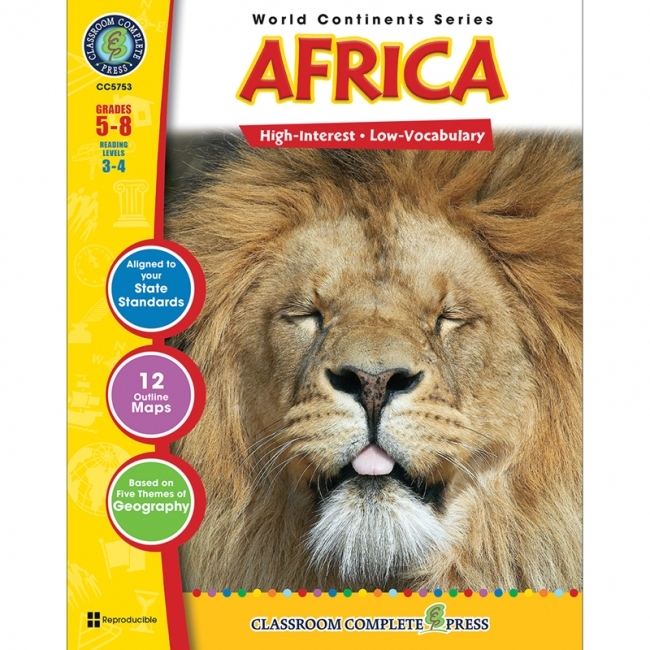 Aligned to your State Standards and the Five Themes of Geography, additional crossword, word search, comprehension quiz and answer key are also included. Includes 113 pages. For grades 5-8. 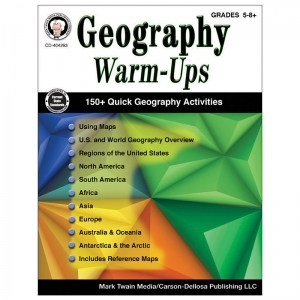 Geography Warm-Ups for grades 5-8 provides mental warm-ups to prepare students for the day's lesson. 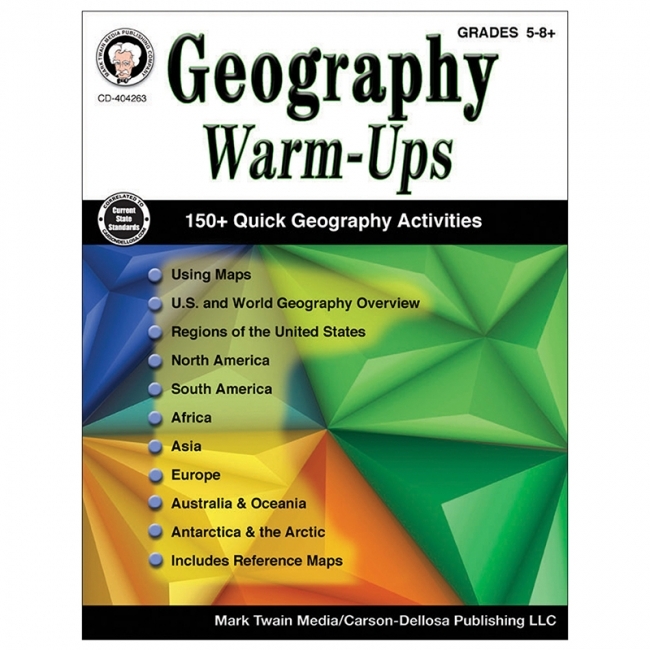 Over 150 warm-ups cover a variety of topics such as US regions and the seven continents. Each page features at least 2 warm-up activities that can be cut apart and used separately. Mark Twain Media Publishing Company specializes in providing engaging supplemental books and decorative resources to complement middle and upper-grade classrooms. Designed by leading educators, the product line covers a range of subjects including mathematics, sciences, language arts, social studies, history, government, fine arts, and character. Help your child navigate his or her way to success with a series that explores and explains important aspects of geography. Spectrum Geography: World for grade 6 doesn't stop with improved geography skills, it provides pages of informational text to strengthen comprehension while children learn about the world. The standards-based Spectrum Geography: World for grade 6 guides your child's understanding of ecosystems, world religions, current events, human migration, and more using colorful illustrations and informational text. 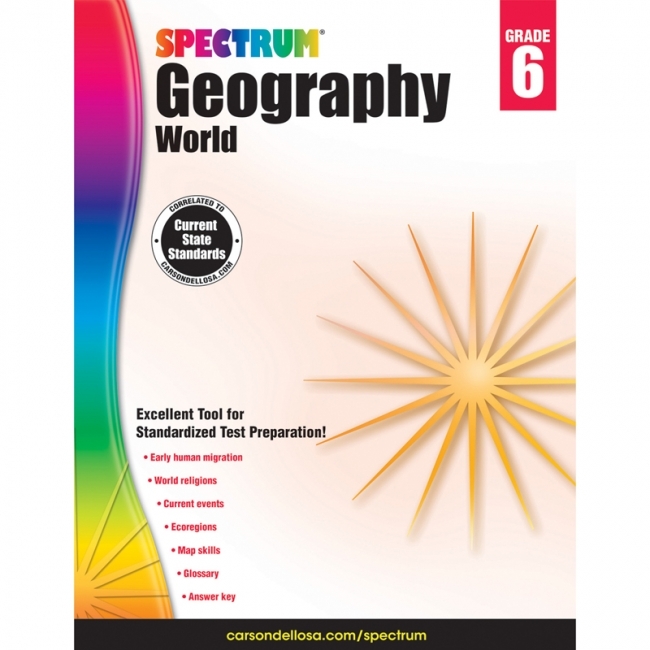 Spectrum Geography is an engaging geography resource that goes beyond land formations and maps, it opens up children's perspectives by taking them on local, national, and global adventures without having them leave their seats. The Complete Book of Maps and Geography for grades 3 to 6 helps children build a solid foundation in map skills and geography. This book provides focused instruction on topics such as maps and map skills, grid maps, US geography, US regions, North and South American geography, and global geography. 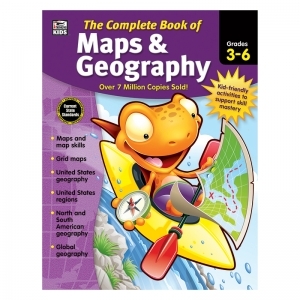 --Filled with child-friendly activities, The Complete Book of Maps and Geography offers a fun way for children to learn about the world that surrounds them. 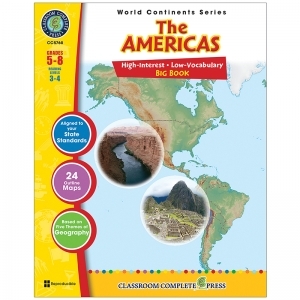 This resource helps children hone the geographical skills they need to succeed. 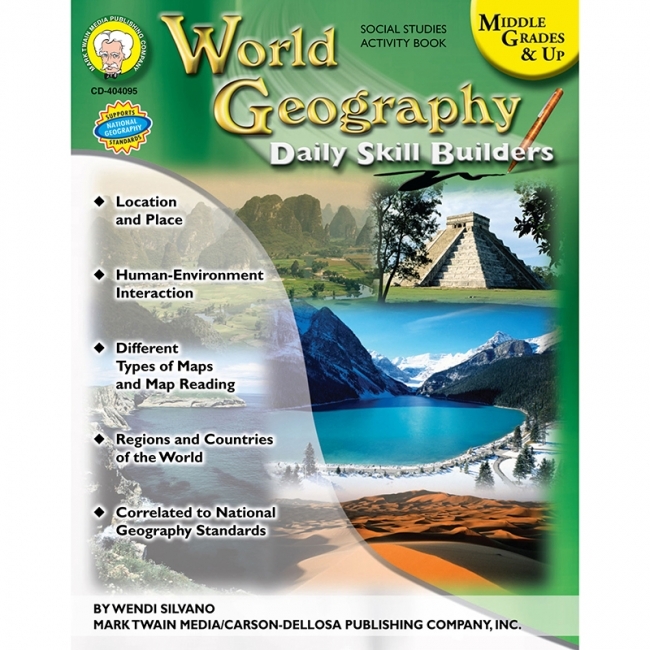 With easy-to-follow instructions and high-interest content, The Complete Book of Maps and Geography encourages independent study and keeps children interested in the process. To help you support this process, this comprehensive learning guide tracks progress and identifies areas that need additional attention. --The Complete Book series offers an engaging way for children to acquire knowledge and strengthen essential skills. 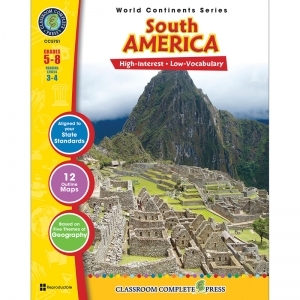 This series features activities that encourage independent learning and support skill mastery in Spanish, handwriting, maps, geography, the alphabet, numbers, counting, time, money, and arts and crafts. 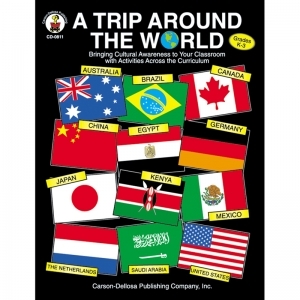 Each subject-specific, comprehensive workbook offers focused instruction and fun activities. The books in this series feature full-color photographs and illustrations that hold attention while children learn important concepts. --With The Complete Book series, students have the support they need for school success! 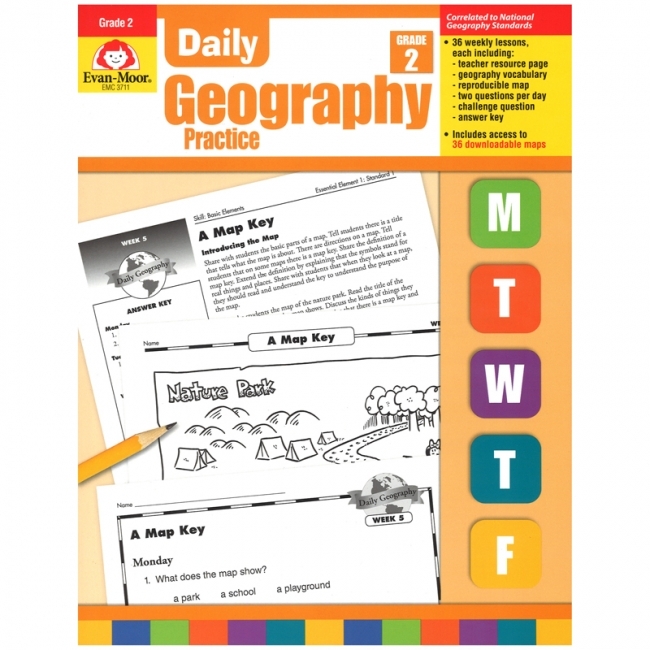 In Daily Geography Practice, Grade 2, 36 map lessons introduce basic geography skills and over 80 geography terms. What a perfect hands-on approach to geography instruction! Provide your students with frequent, focused skills practice with this Reproducible Teacher's Edition. The reproducible format and additional teacher resources give you everything you need to help students master and retain basic skills. 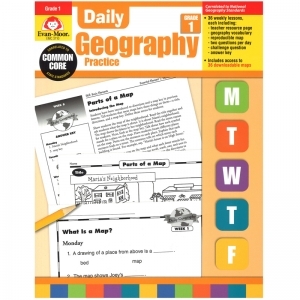 Daily Geography Practice contains quick 15-minute lessons that help students become geographically literate. Each of the 36 weekly lessons includes a teacher resource page, a reproducible map, and 2 student reproducibles. In Daily Geography Practice, Grade 3, 36 map lessons introduce basic geography skills and over 100 geography terms. What a perfect hands-on approach to geography instruction!